Environment Canada said a strong cold front was expected to move from the north to the south across the province starting late Friday morning. Strong winds are blowing into southern and central Alberta, and could be bringing a little snow with them. Environment Canada said a strong cold front is expected to move from the north to the south across the province starting late Friday morning. "Winds will begin to gust out of the northwest in excess of 90 km/h. Winds are expected to ease late this afternoon into the early evening hours," the agency said in a wind weather warning. "Periods of rain will change to a brief period of snow behind the cold front." Winds warnings are issued when there is a significant risk of damaging winds. Environment Canada warned drivers should be prepared to adjust to changing weather conditions. 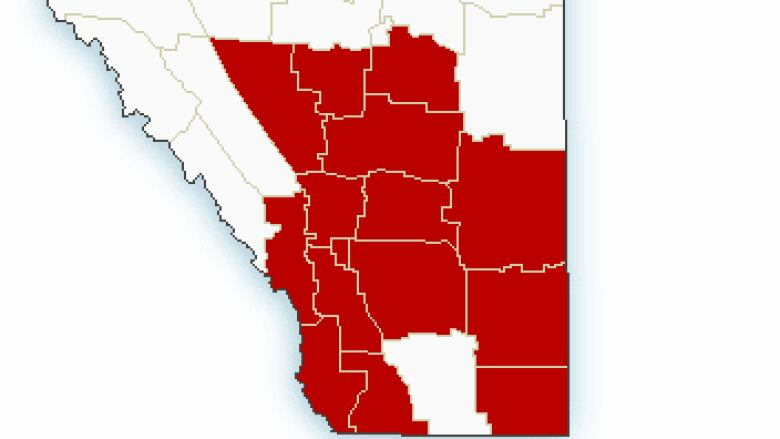 Most of southern Alberta was under a wind warning throughout the day, but that had been reduced by the afternoon. For up-to-date weather information, visit the Environment Canada website.